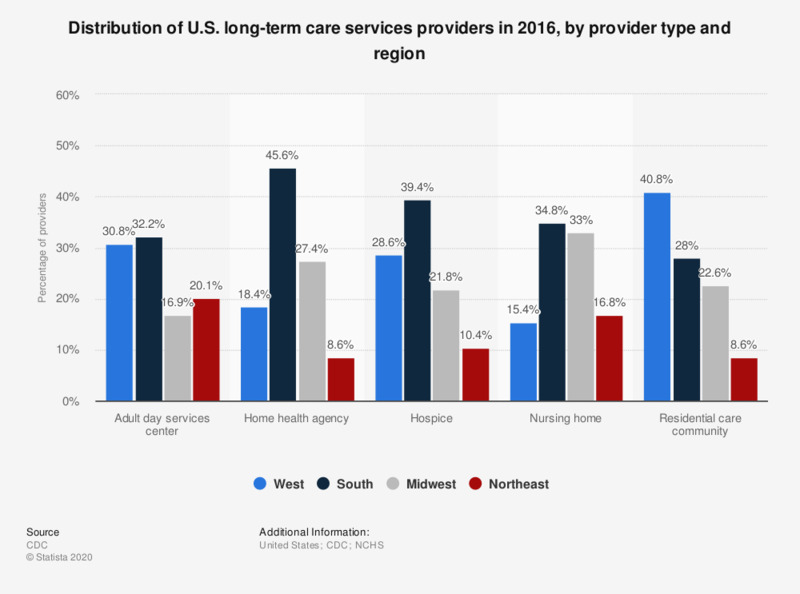 This statistic depicts the distribution of long-term care services providers by provider type and by region within the United States in 2014. The southern part of the United States accounted for 46.6 percent of home health agency services in that year. Long-term care services account for a variety of services such as health, personal care, and supportive services dedicated to frail older people and adults with a limited capacity for self-care in cases such as injury or mental disability. This statistic is based on about 57,000 paid, regulated long-term care services providers serving about 9 million people in the United States. Long-term care services were provided by 4,800 adult day services centers, 12,400 home health agencies, 4,000 hospices, 15,600 nursing homes, and 30,200 assisted living and similar residential care communities.